I had big plans for the day – we were going to walk to the post office, hang at the park, and enjoy some time outdoors. But, for some reason, it is raining. Weather in the Bay Area is temperamental and you can see rain in one microclimate and hot and sunny in another. I’m usually in the hot-and-sunny spot, so this rain has me a bit frustrated. We adjusted our plans and got out our paints. My daughter loves pulling her brush through a paper completely coated with a single color of paint, which reminded me of Bridget Riley and all her Op Art creations. We took a closer look at her paintings and got busy creating a fun line-making tool. Most of Riley’s paintings are in black and white, but she uses color, too. Her paintings encourage the eye to move all over the creation, causing one to see not just the lines, but the hue or color of the lines grouped together in a collective formation. Op Art is all about creating movement through the use of optical illusion, so you could say Riley is the Zen mistress. This is a great activity for kids of all ages. For the younger set, an adult can help create the line making cardboard tool, and kids that are well-versed with scissors can do the cutting themselves. It’s as simple as repurposing a piece of cardboard about 4 by 6-inches, getting out some tempera paint, brushes, paper and scissors. Riley considered the color of paint an important part of her paintings, so encourage your child to select a single color she feels would really make her creation pop. My tot is in love with red, so red it was. 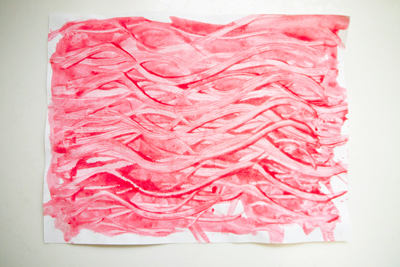 Before covering the paper with paint, invite your child to create a line-making tool. She can use a ruler to measure and mark where to make cuts or randomly cut triangles out of one side her piece of cardboard. My child is a bit young for this part, so I used my crafty scissors to create the cardboard tool for her. Set that line-making tool aside and get ready for some paint! Place a piece of white paper on your work surface and invite your child to slather that paint all over the paper. Remember, this part might get a bit messy, so cover things as needed. Once your child has coated the paper with paint, she can pull her line-making tool across the paper, creating straight or wavy lines. She can go back and forth across her paper as often as she’d like. Enjoy the finished Op Art creation on the fridge or displayed in a special spot in your home!